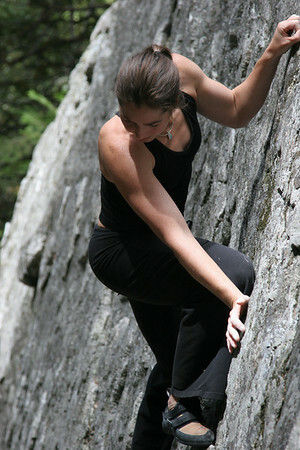 Home » Bouldering » Rock Climbing » Bouldering or Blundering? My phone auto-corrects "bouldering" to "blundering" whenever I try to text someone about climbing. Its quite accurate actually, when you think about it. Rock climbing, especially bouldering, is all about trying moves and problems that are way too hard for you over and over again until you find the exact right, foot, hand, breath, and core tension moment that allows you to complete a sequence. After multiple tries you might actually figure out the correct inner thigh squeeze, toe point, and finger positioning to complete said move/problem, which only means you can keep going to try to finish the problem, or take a quick break and then try a new (harder) problem. MommyTasker - Blundering from MommyTasker on Vimeo. I have probably fallen on that same move at least 20 times. Since I can do the move fresh, I know that it is just a matter of time until the whole problem comes together. One night I will find that sweet spot between being warmed up, but not too tired, and send that thing. Until then, I will keep trying this same problem a few times a night, until my fingers and arms give out. In some ways, I guess this looks a little like beating your head against a wall, with little glory if you do achieve a breakthrough. Perhaps, but I like to think of it as developing discipline and fortitude and a really firm handshake. I think those things can carry you pretty far in life, as does the ability to pick yourself up after a fall. That being said, posting this video of me falling clumsily to the ground is not that easy. Part of me would much rather show you an awesome video of me sending - making it look easy. But the reality is, we don't always send. For the most part, we are just out there trying our best, and not always succeeding, at least not on the first go. For me, that is a big part of what this blog is about - not just the celebration of success, but the celebration of getting out there and doing. To be out there, you can't be afraid of the bumps and bruises and meltdowns that are likely to happen along the way - rather, you have to embrace them and own them as part of the experience. So, really, I don't mind if you laugh at my clumsy exit from a failed attempt to send a problem tonight. What I do hope you also do though is think - hey, it looks like you don't have to be perfect to climb and enjoy it, maybe I should give it a try. Yes! Whether its trying climbing, or a run, or a new class at the gym - you should and then share with us how it went. We want to know about your triumphs and the times you fell flat on your face. We have all done both, and as we all know, a healthy dose of resilience never hurt anyone.